There are 15,000 new cases of Amyotrophic Lateral Sclerosis (ALS) diagnosed each year in the United States. One hundred cases of ALS, also known as Lou Gehrig’s disease, are diagnosed in Upstate New York annually. For those identified with ALS, as well as their families and caregivers, the Upstate New York Chapter of the ALS Association is the place to turn for compassion, understanding, support, advocacy and guidance. From left to right are Elizabeth Krisanda, Rebecca Coulter and Monica Shworles. When patients and their family hear a diagnosis that has no cure, their world is turned upside down. Navigating the medical system, as well as state and national government agencies like disability and Medicare services, is overwhelming. Elizabeth Krisanda ’86 is the executive director of the Upstate Chapter of the ALS Association. “We are the ‘boots on the ground’ helping people with ALS figure out how they are going to live their lives in the wake of a devastating diagnosis,” she says. 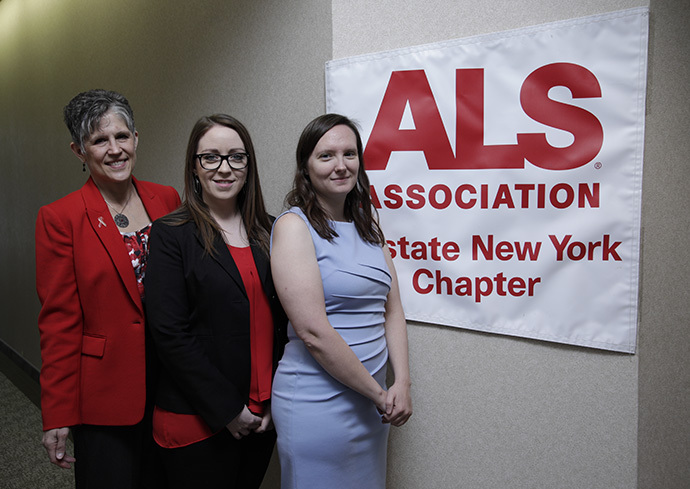 With an annual budget of approximately $1 million, the local chapter receives the bulk of its funding from the Walk to Defeat ALS, which takes place in Buffalo, Rochester, Syracuse and Binghamton each summer/fall. A golf tournament held in July raises the funding necessary to provide support services and supplies to individuals living with the disease. Rabecca Coulter ’07 graduated from Syracuse University with a degree in child and family studies from the Falk College of Sport and Human Dynamics. After completing a master’s degree in social work from the University at Buffalo, she began her career at the ALS Association, where she is the care services manager. Coulter is on the front lines every day helping patients and families. “Our chapter offers a number of services and programs free-of-charge to individuals living with ALS―education and information, home visits, in-person and call-in support groups, medical equipment loans and financial grants, to name a few,” she says. The Ice Bucket Challenge first received media attention in 2014 to increase funding for ALS research and raise awareness of the disease. The challenge encourages nominated participants to be filmed having a bucket of ice water poured on their heads and then nominate others to do the same. Those nominated have 24 hours to comply or forfeit the challenge by way of a charitable financial donation. “Since the Ice Bucket Challenge, five new genes have been discovered,” says Krisanda. “Each new gene represents a new therapeutic target.” She says that there are currently 108 research projects underway in 10 countries, including 10 projects underway in New York state. Carlos Castaneda, assistant professor of biology and chemistry in the College of Arts and Sciences, is the principal investigator on a pair of research projects studying the function of cellular proteins and their ability to form protein-containing droplets inside neurons. A better understanding of these proteins may lead to new treatments for neurological disorders such as ALS. “The ALS Association project focuses on understanding the effects of ALS-linked disease mutations on ubiquilin-2 function in the test tube and in cells,” Castaneda said in a 2018 Syracuse University News story. “We aim to figure out what causes these protein-containing droplets to morph into aggregates characteristic of neurological disorders like ALS.” The University of Rochester and Cornell University also have research projects underway. In November 2018, Tim Green, former Syracuse University football All-American, NFL player, author and commentator announced his diagnosis of ALS on “60 Minutes.” Syracuse University will retire Green’s jersey during its game against Clemson on Sept. 14–the same day as the local Defeat ALS Walk at Longbranch Park in Liverpool. Green’s nonprofit fundraising campaign, Tackle ALS, has raised more than $2.6 million to date for the Healey Center for ALS at Massachusetts General Hospital. Syracuse University alum Monica Shworles ’05 is the regional development manager at the Upstate New York Chapter of the ALS Association. She considers it an honor to organize the various fundraising events.